Slightly softened by their raspberry filling, fragrant with hazelnuts and a touch of cinnamon, Linzer cookies are a special treat. However, these pretty little cookies can be a real pain to make. The dough can be sticky and difficult to handle when you are after perfect scalloped edges and crisp center cutouts. I seem to be cursed every time I make these—from the motor on my food processor giving out in the middle of grinding nuts, to struggling to get the skins off the hazelnuts, to the dough sticking and ruining the shape of my cookies—I’ve experienced pretty much every way these can go wrong! It can be a real heartbreak to watch the shapes all smoosh and fall apart after all the work you’ve put into them. In this post I share the tips and tricks I’ve honed to get these cookies to turn out delicious and pretty with minimal fuss. Read on to learn how! Divide the cookie dough into two and place each half onto a sheet of plastic wrap. Flatten each ball into a disk, wrap and toss into the fridge to chill for two hours. This will make the dough easier to work with when it’s time to roll it out. Once it’s done chilling, prepare your work surface (this step is very important!) Lay a sheet of wax paper on the countertop (I like to tape the sides down with just a small piece of tape on each edge). If your wax paper is not very large, overlap two pieces. Then, lightly flour this surface (without the flour, the cookies will still stick to the wax paper—little buggers!) Next, remove one cookie dough disc from the fridge, and place onto the prepared work surface. Lightly dust the top with a bit of flour, then add another piece of wax paper on top. Roll out the dough to a thickness of 1/8″, running your hand over the dough to check that it is as even as possible throughout. I used a specific Linzer cookie cutter but found it to be very disappointing. The dough does not stay in the cutter and remains stubbornly on my work surface instead, as shown below. To get around this, I used a metal offset spatula. First I gently lifted away the excess dough; then very carefully slid the spatula between the cookie and the wax paper to lift it off and transfer it to the waiting cookie sheet, taking care not to stretch the cookie. This was the most delicate part; once the cookie was on the spatula it was easy to flip it off onto the baking sheet. Once you’ve got all the cookies cut out and on the baking sheets, chill the baking sheets in the fridge for about 15 minutes. This is critical to help the cookies keep their shape for the next step: cutting out the centres for the pretty filling reveal. Count your cookies, ideally you’ll have the same number on each cookie sheet. You need to cut out the centre window shape on half of the cookies. Cut the windows all out on the same baking sheet as they bake a bit faster than the cookie bottoms, if they are together you take them out of the oven a minute or so before the bottoms. Another disappointment with my cookie cutter: it came with an insert to hold the centre in position, however when you press down it leaves a terrible ring around the edge of the cookie. No good! Instead I just free-handed it, placing the hearts in the centre as best I could—most were pretty close. Bake the cookies, removing them from the oven when the edges are lightly golden. Allow to rest for a minute or so (but not much longer) and then transfer the cookies to a wire rack to fully cool. I left the cookies on the baking sheet until they were fully cooled once and guess what, they wanted to stick to the cookie sheet, too! Take all of the bottoms and spread with a generous dollop of raspberry jam, keeping the edges clear so the jam doesn’t smoosh out and make a mess when you put the tops on. 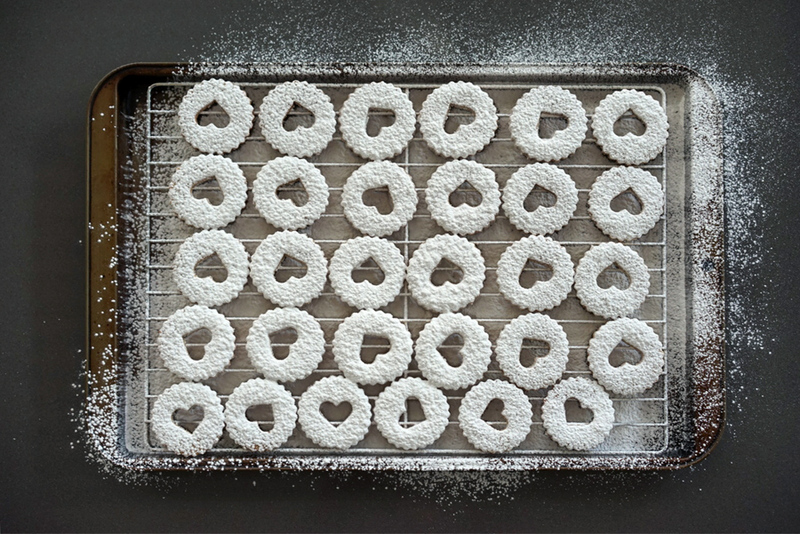 Take the rack of cookie tops, and sift them with icing sugar. I like to use a generous amount. So pretty! Finally, assemble the tops to the bottoms, being careful not to get any powdered sugar on the jam areas. I found giving the tops a light tap underneath before adding to the cookie bottom helped a bit. Don’t forget to fill your baby-linzers, too. And you’re done! Well almost. You’ve just spent all this time making these beautiful cookies, but how to store them without getting powdered sugar all over the centres? I take a round metal tin, trace the lid onto some wax paper, and cut out perfectly fitted wax paper liners (about 5–6). Line the bottom, place cookies in a single layer, top with a wax paper sheet, and keep layering until your precious cookies are all carefully packaged up. A pain to make, but so delicious, I love Linzer cookies and wouldn’t have them any other way! Adapted the Linzer Cookie Recipe at Epicurious. The cookie version of the famous Austrian cake, these lightly spiced cookies with raspberry filling are a delight! Toast hazelnuts in a preheated 350° oven for 6–8 minutes. Allow to cool, then pulse in a food processor with 1/4 cup of brown sugar until finely ground. 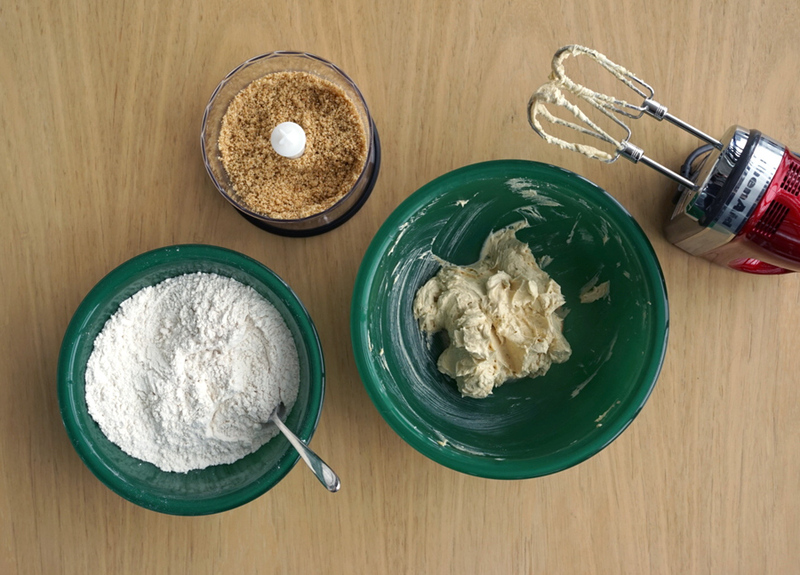 In a medium bowl, combine the flour, baking powder, salt and cinnamon. 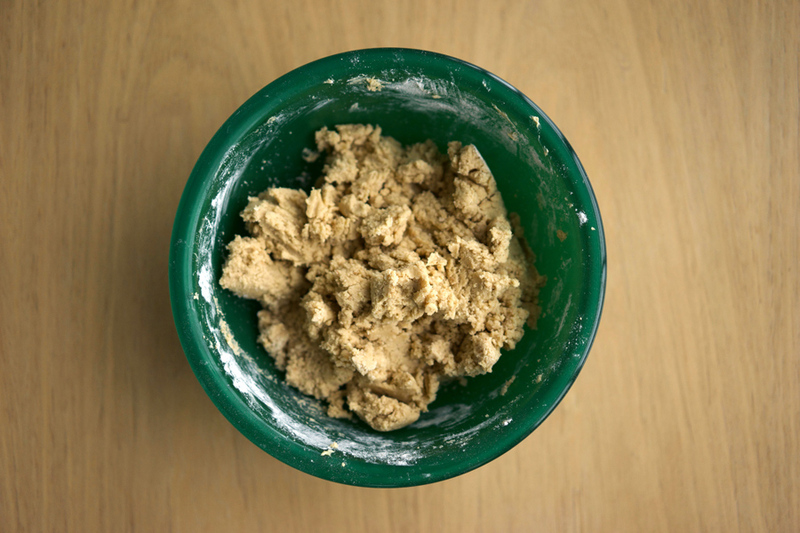 In a large bowl beat 1/4 cup brown sugar and butter with a hand-mixer until pale and fluffy, about 6 minutes. (About half that amount of time if using a stand-mixer) Add nut mixture and beat until well combined, about 1 minute. Beat in the egg and vanilla. Stir in the flour mixture until partly combined, then beat on low speed to fully combine. Divide dough into 2 and form each half into a flat disk on plastic wrap. Wrap and chill in the fridge for 2 hours. Prepare a clean counter surface with a large sheet of wax paper, using a small piece of tape on each side to help hold it in place. Sprinkle with flour. Remove one disk of dough from the fridge and place onto prepared surface. very lightly flour the top of the dough and add an additional piece of wax paper on top. Roll out the dough to 1/8" thick, and remove the top layer of wax paper. Have two cookie sheets ready beside your work area. 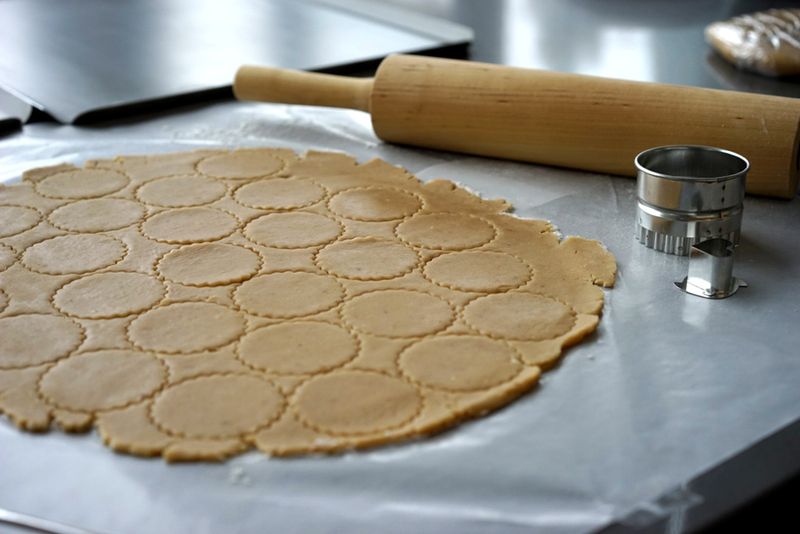 Using cookie cutter, cut cookies as close together as possible to maximize the dough. If the cookies don't stay in your cutter to transfer onto the cookie sheet and remain on the wax paper instead, gently lift away the excess dough using an offset metal spatula until the edges of the first row of cookies are exposed. 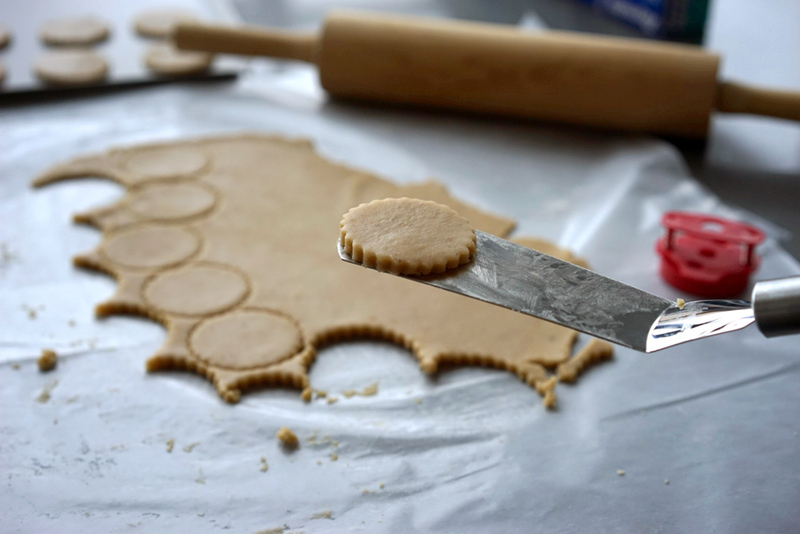 Gently slide the offset spatula between the cookie and the wax paper layer, lifting the cookie being careful not to allow it to warp or stretch to maintain the shape. Transfer to cookie sheet, leaving 1" between each cookie. Repeat with remaining dough until your two cookie sheets are full. Transfer the cookie sheets to the fridge to chill for 15 minutes. Preheat oven to 350°. Once chilled, remove cookies from fridge and using the smaller heart cutter, cut out the centres from half of the cookies. Gently remove the centres, (I found a toothpick worked well to flick them out while preserving their shape). Drop the small cutouts onto the baking sheet in the spaces between the cookies, distributing on the two sheets if needed. Place in preheated oven and bake for 10 – 12 minutes, until edges are lightly golden. 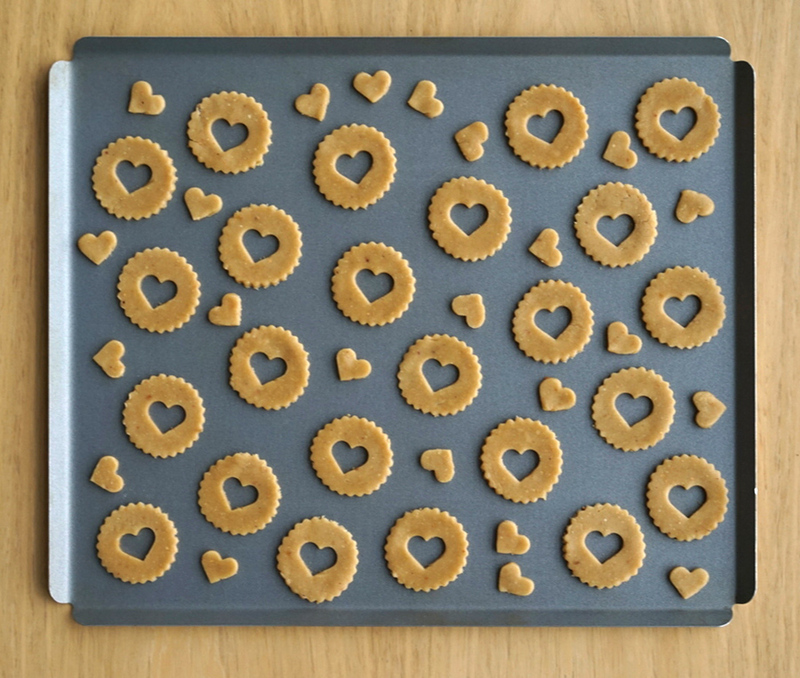 Allow cookies to cool for a few minutes on the cookie sheet, then transfer carefully to a wire rack, keeping the tops separate from the bottoms (and mini-hearts will be too small for the rack, they can cool on a plate). Asses your dough scraps, press together into a disk and transfer to the fridge to chill. Dough can be re-rolled once or twice max in this manner. Complete cookie cutting and baking process until all cookies are baked and ready. Once cool, take the wire racks with the top halves with the cutouts and place on a baking sheet. Sift icing sugar on top and set aside. 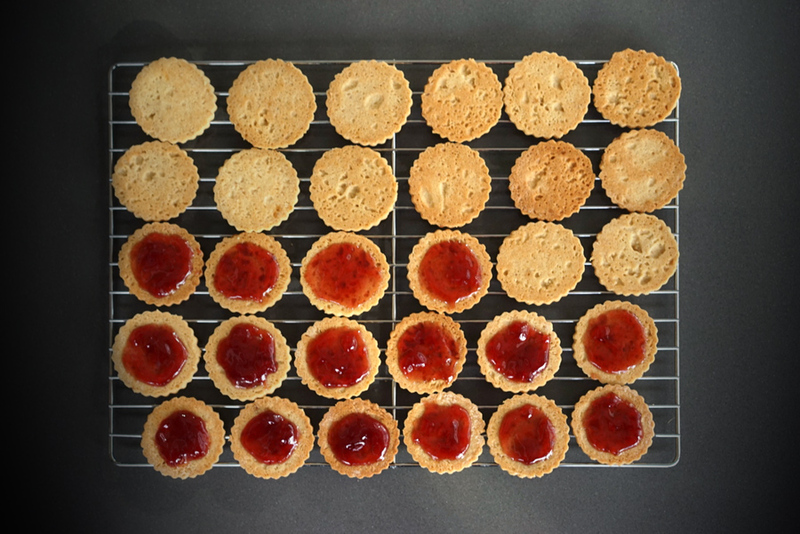 Spread jam onto the bottom layers, using a generous amount and keeping it in the centre with a 1/8" clear area around the edges of the cookies. As the jam squishes out when you add the tops, this will keep them neat and prevent the jam from oozing out the sides. Carefully add the pretty dusted tops. 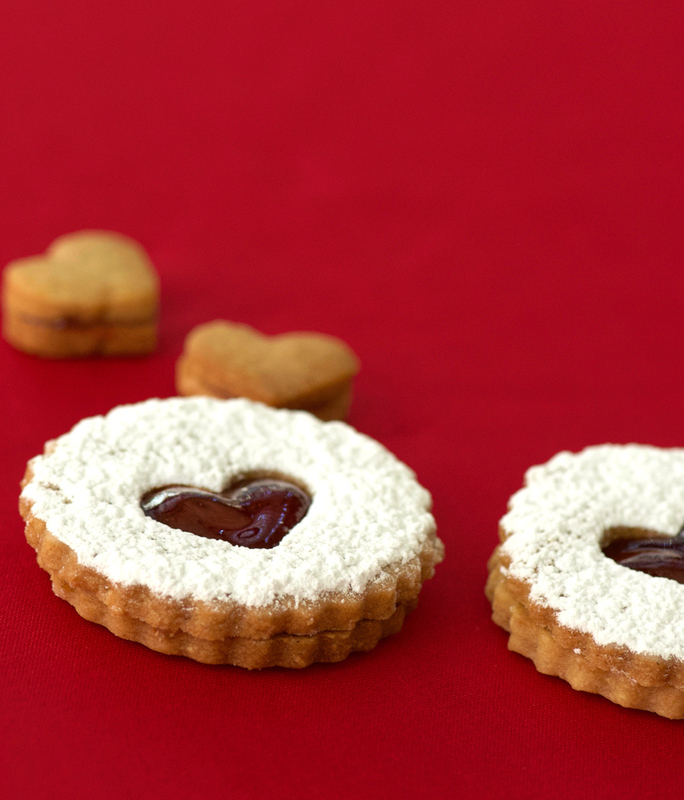 I like filling the baby heart cookies with jam as well, without any sugar on top. I’ve always loved these cookies but they look so labor intensive. Your instructions are great, though, so maybe I’ll try it sometime. Those are so pretty and sound so tasty! I’ve pinned the recipe for later. These look amazing! 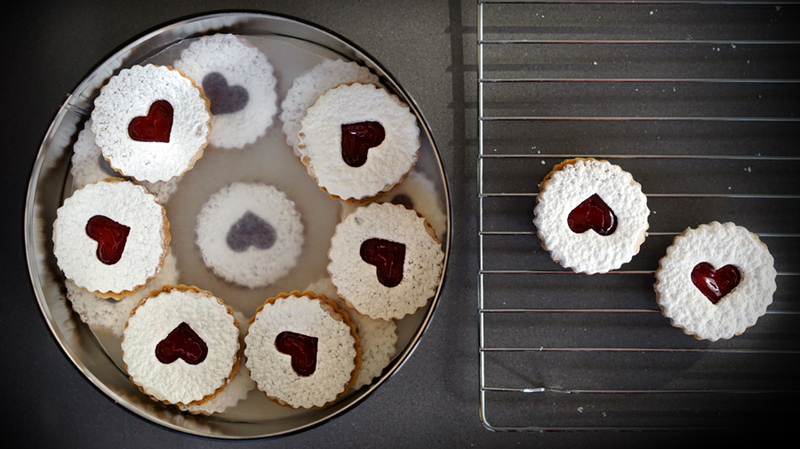 I have a linzer cutter in my baking cupboard that I’ve never used – you’ve inspired me to break it out for Valentine’s Day! 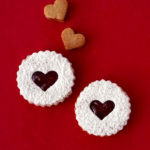 These cookies are always a big hit and they do look wonderful for Valentines Day. Kids love to eat the cut out hearts. These are so pretty and obviously right on time for Valentine’s Day! This is a great recipe for me to bake up with my kids. Yum!! I could so eat one–or all–of these right now!!! I absolutely love linzer cookies! Thank you for sharing this recipe- I need to make them this weekend!